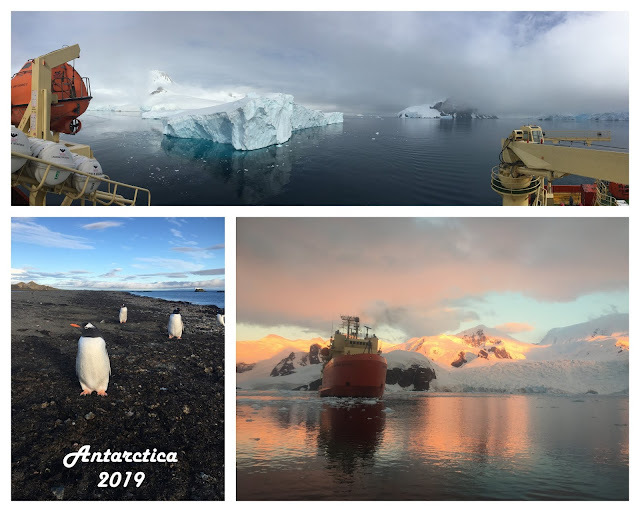 Alex was in Antarctica again from mid-February through most of March. I held down the fort back at home and got things ready for my trip down to Chile. 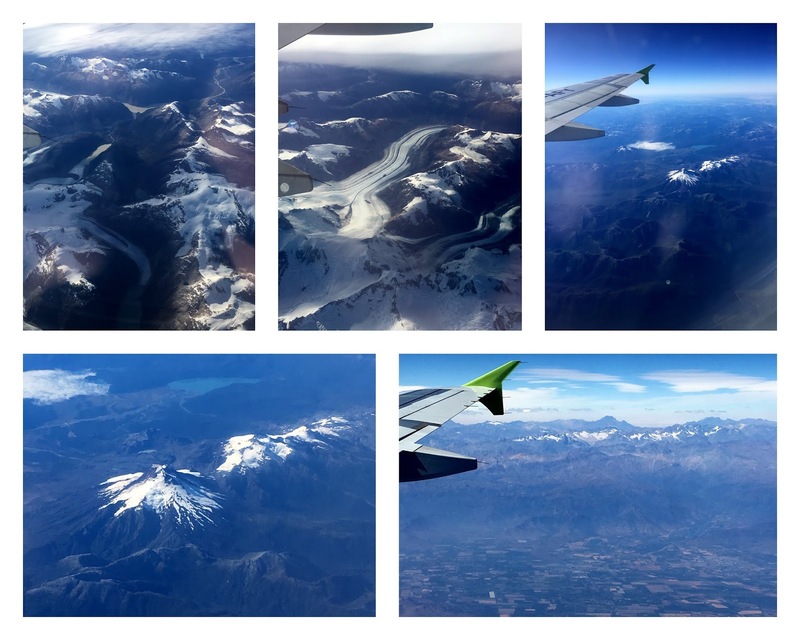 I flew down to Chile on March 20th, leaving in the afternoon. My trip started off a little hectic, when I realized that I had not switched my shoes out from going to help in Weston's class that morning. I was supposed to switch to my running shoes, which were a little muddy from my morning run. I forgot to put those on before I left, and I really needed them since I knew I would be hiking around a lot in Chile. Luckily we live close to the airport, so I went in to check my bag while my parents headed back home to get my shoes. They made it back in time to swap out the shoes and I made my flight. My first flight was to Dallas, and I didn't have any problems there. The long flight went well, but I couldn't sleep. I arrived in Santiago about 8:00am there. My flight to Punta Arenas wasn't until 2:30pm, so I already had 6.5 hours to wait around. I got my checked bag, went through customs, and re-checked my bag for the next flight. I sat around for a long time and then about 2 hours before my flight, I went through security and sat at the gate. However... when I was trying to board, my ticket wouldn't scan. It turns out that wasn't my flight and I had been sitting at the wrong gate. I was confused because the flight was going to Punta Arenas via Puerto Montt, but apparently there were 2 flights leaving about 15-30 minutes apart going the same places. AND the flight numbers were both 200-something. When I had looked at the flight board earlier, I only saw the one flight (the wrong one). By the time I was denied boarding on the flight and looked at the board again, my flight said "last call". I ran to find the gate, but it wasn't even on the same level. By the time I found the gate downstairs, it was too late. I missed my flight. I guess I could have left the airport for a while, but where was I going to go? Tired, not knowing any Spanish, just wandering around by myself in a big city? So I sat and waited at the airport another 8 hours. Alex met me at the airport in Punta Arenas at 3:30am with a taxi (thankfully I didn't have to worry about that when I got there). I think by the time I went to sleep, I had been up for about 41 hours. 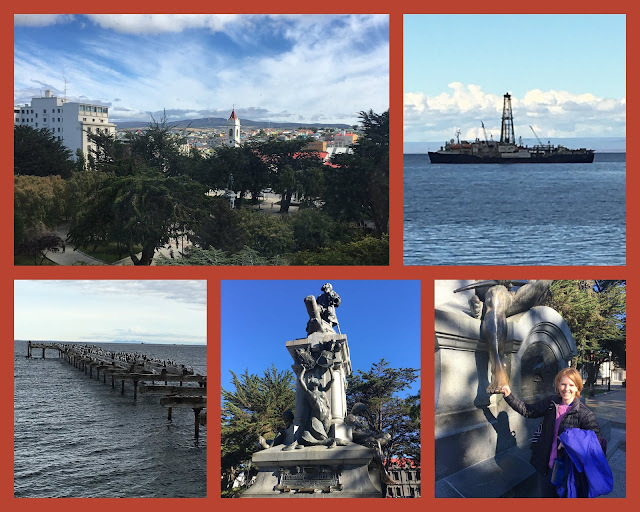 On Friday, we got to tour Alex's ship and wander around Punta Arenas. PA is where Alex goes in and out of when he goes to Antarctica. The 2nd picture below is a famous boat that was docked in PA when we were there. I hadn't heard of it before, but Alex was really excited about it - the Joides Resolution. There is a statue in the middle of PA of Ferdinand Magellan. Legend has it that if you touch/rub his toe, you will return. Alex and his group always make a point of touching the statue's toe before they head out so they can safely return from Antarctica. I touched his toe too, so I guess I'm going back to Punta Arenas some day! On Saturday, we went to see a fort, but it was pretty disappointing. It cost a lot to go in, and then there wasn't much to it. The lady said it was "muy interesante", so we decided to go. However, maybe the best part is the view of the ocean, which we couldn't see at all (because it was foggy). Just our luck. This tree was "muy interesante" though! We also had a nice drive around on Saturday. 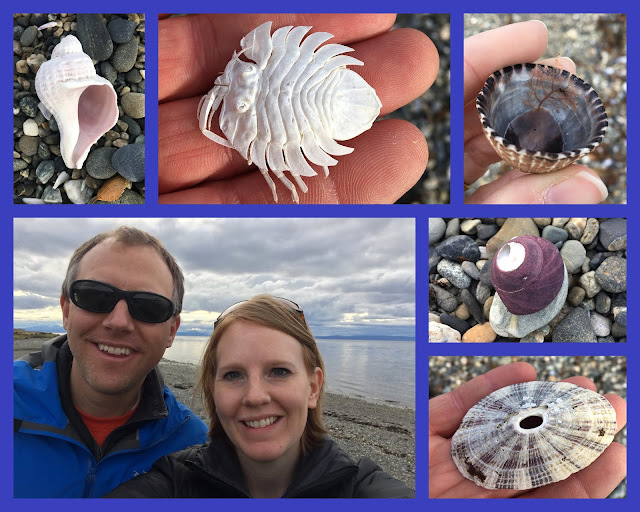 We stopped at a beach, which had all kinds of cool shells. We decided to keep the decapod shell and a couple other shells - they came back with us and made it through customs. (I wasn't sure about bringing shells in, but they made it). 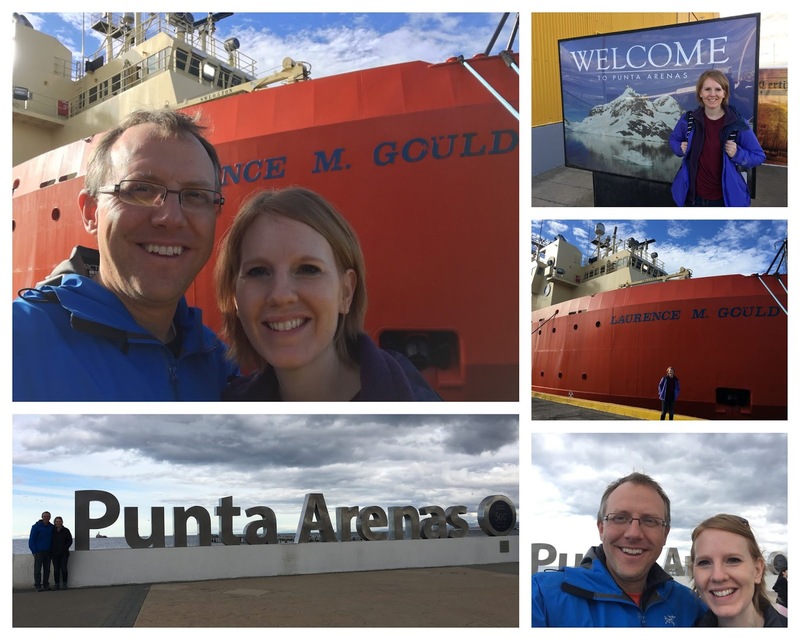 We went to church in Punta Arenas on Sunday morning. 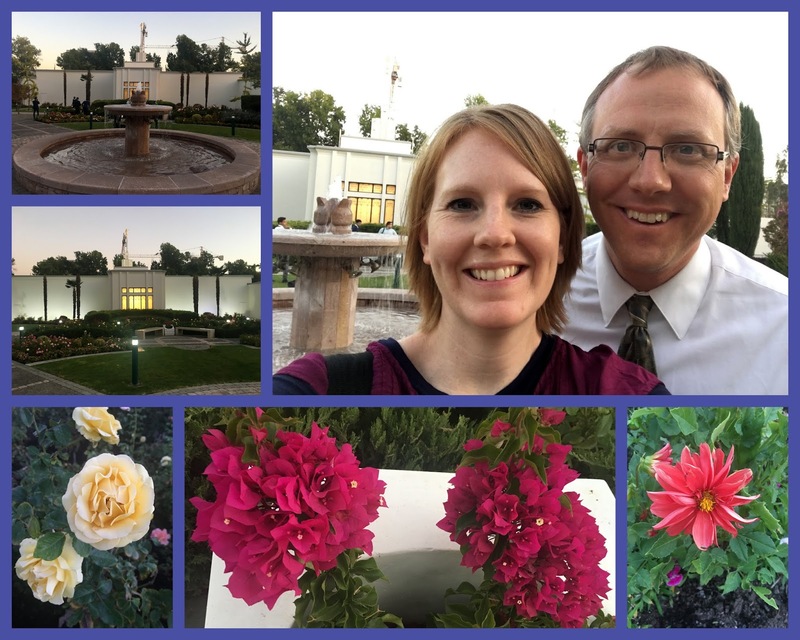 We didn't understand much of the Spanish, but we were there to take the sacrament. That's the one thing that it doesn't matter the language - the ordinance is the same. I did pick a few words out of the talks - such as temple and family and Jesus Christ. People came and tried to talk to us afterwards - Alex did pretty good with his high school Spanish - he could say enough for them to know a little about us and why we were there. We weren't very good about answering any questions, but Alex could say his story. The only thing I could say was "cinco ninos..." - ha ha. I took French in high school, so my Spanish is very limited. I did pick up a few words just being there for a week though. We got by pretty well without knowing Spanish. I could have used it in the airport when I was running around like a crazy lady looking for gate 31. Most places we went there was someone who knew some English, or Alex knew enough to get by. 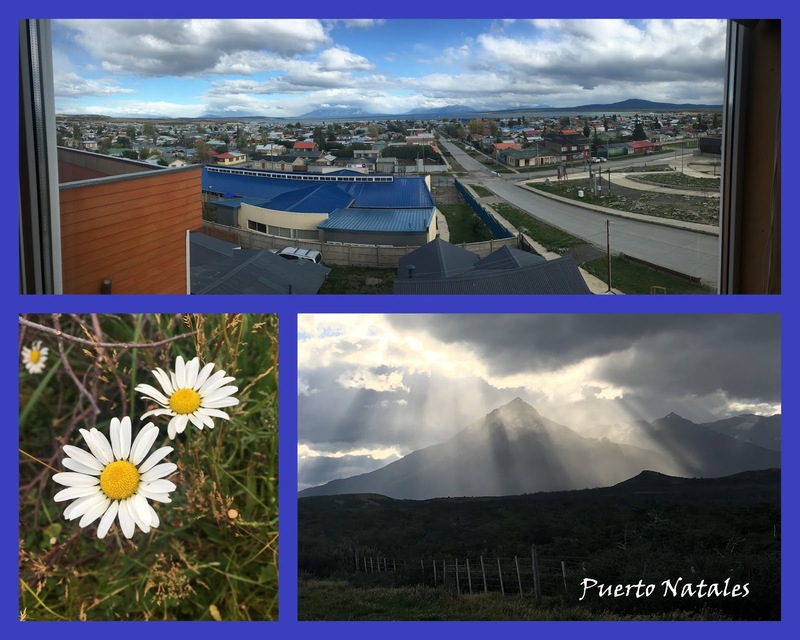 On Sunday afternoon, we drove to Puerto Natales - we had a very nice view from our window. 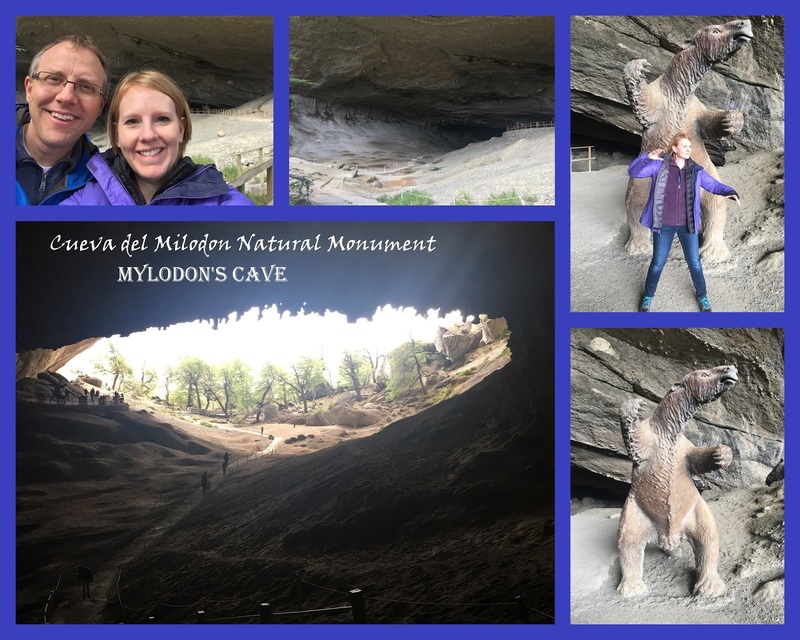 We did go out a little bit on Sunday afternoon, to see a cave, Cueva del Milodon Natural Monument. The Mylodon is a sloth - I'm standing by a replica of it (think about Sid in the Ice Age movies, although he was a pretty small creature in the movie). This is a life sized replica of the giant sloth. It rained just a little bit on us, but that provided a really pretty rainbow. That was the only rain we got all week. 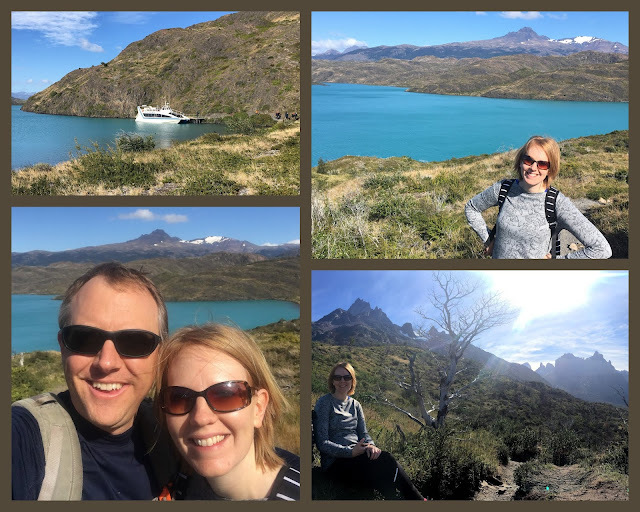 We had good weather, being there in Chile's fall - it was a little cold sometimes, about 55, but that feels pretty good when you're hiking around. It was pretty windy sometimes too. 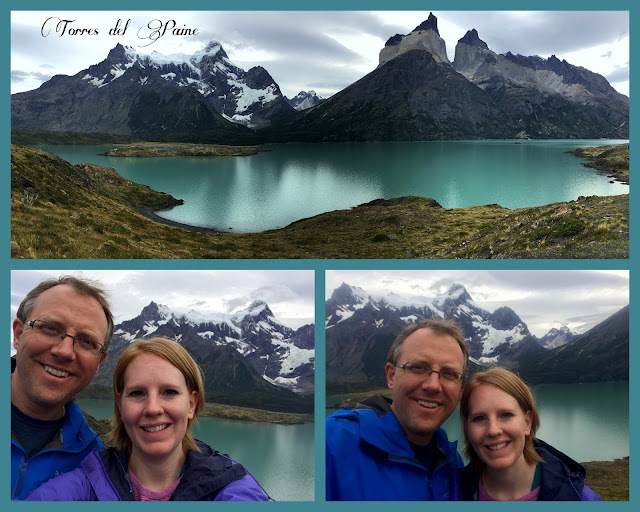 We spent Monday and Tuesday in Torres del Paine National Park, which was a gorgeous area. 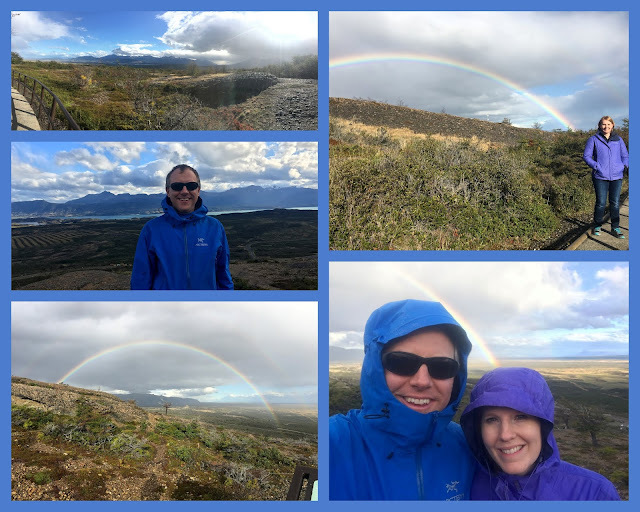 From Puerto Natales, it was about a 1.5 hour drive to the park. On Monday, we planned to take a boat to our hiking spot. About 15 minutes out from Puerto Natales, we realized that we hadn't filled up with gas. We had to turn around and go back, since there were no gas stations anywhere near the National Park. That was okay, except then we were a little rushed to make the boat (that turned out to be the last one of the day). We also didn't realize we would have to spend Chilean dollars for the entrance fee for the park (they didn't take credit card), and they also wouldn't take a card for the boat. We didn't have enough money for the ride (or so we thought). That boat ride was cutting off about 7 hours of hiking to get to the spot we wanted to see. We didn't have time to walk that many miles. We turned away from the boat ride, feeling sad, knowing there wasn't an ATM anywhere or time to even go back to the car. But then as we were walking, Alex realized that I might have US $ with me (and we hadn't thought about being able to pay in US $). I had just the amount we needed ($50 - for one of the tickets). Alex had enough Chilean pesos for the other ticket. We turned around and ran back, just barely making the boat before it took off. Whew! We still had a long day hiking - hiked about 14 miles (so you can see why we couldn't have added another 14 miles to the day without the boat ride.) 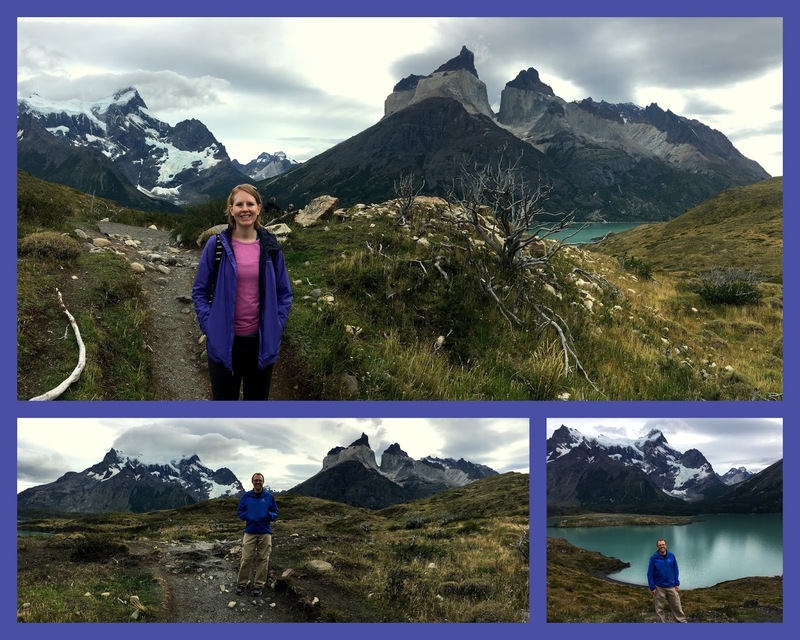 We got a nice view of Lago Grey, a glacier, and some nice views of the prominent mountain range (Torres del Paine - which means "towers of blue"). 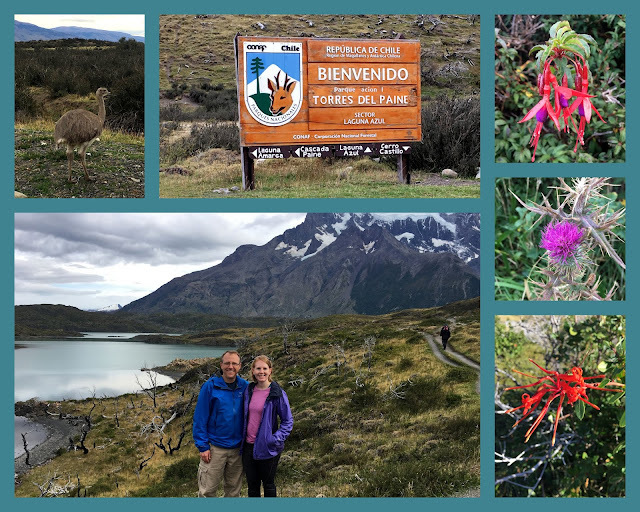 I also loved the turquoise blue water in some of the lakes, the waterfalls, and the guanacos (similar to llamas or alpacas) wandering around. It was so windy here at Lago Grey! The lighting wasn't great either, by the time we got there in the afternoon. We stayed near the park on Monday night in these little cabins - great setting. 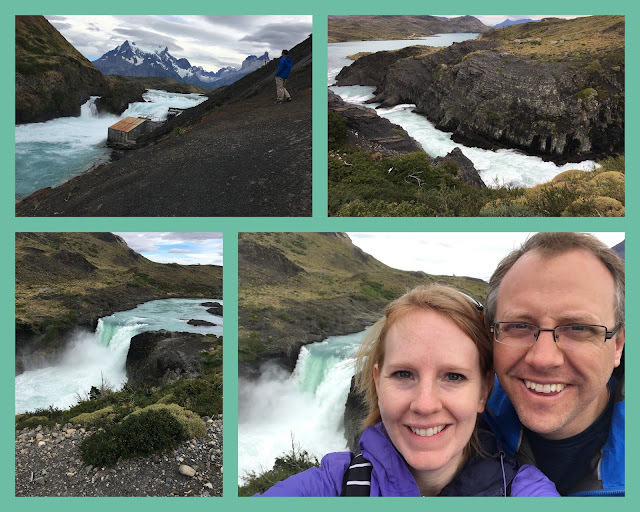 We saw more waterfalls on Tuesday and did a much shorter hike. 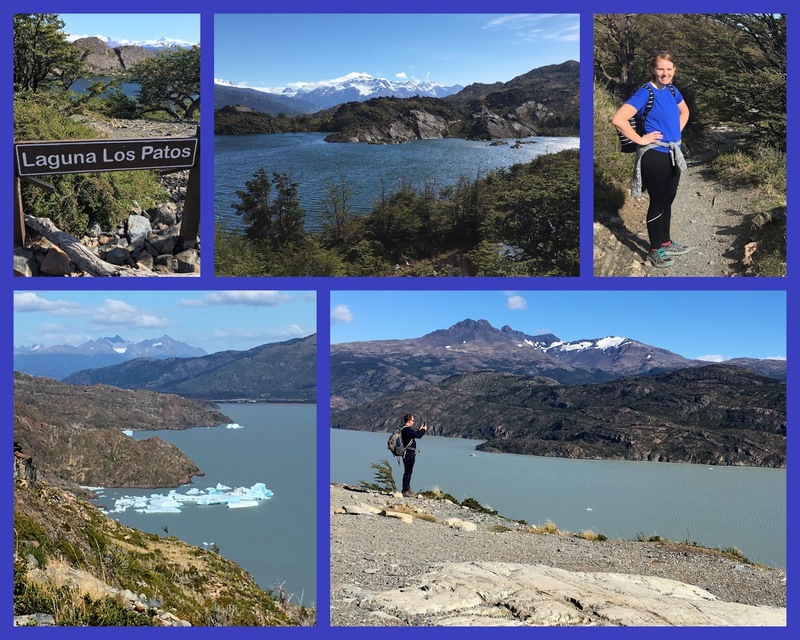 I thought our view of the mountains was much better on Tuesday, and the hike was so much shorter. If we could do it over again, we would have paid for the more expensive boat tour on Monday. I think there was a $90 longer boat tour that would have provided a closer view of the glaciers. Then we could have still done the short hike on Tuesday to get the views of the mountains. Next time I guess! This was our view on Tuesday, and we only hiked in about a mile or so! We got to see some of the ice calve from the top while we were there. Trying to film the ice calving - you can't see it very well, but there is a line of white flowing in the top center of the peak. We could hear the ice breaking off at the start of the flow (but not in this video). This waterfall was in another part of the park. We were glad that we rented the vehicle (Range Rover?) we did, because some of the roads were a little rough in the park. 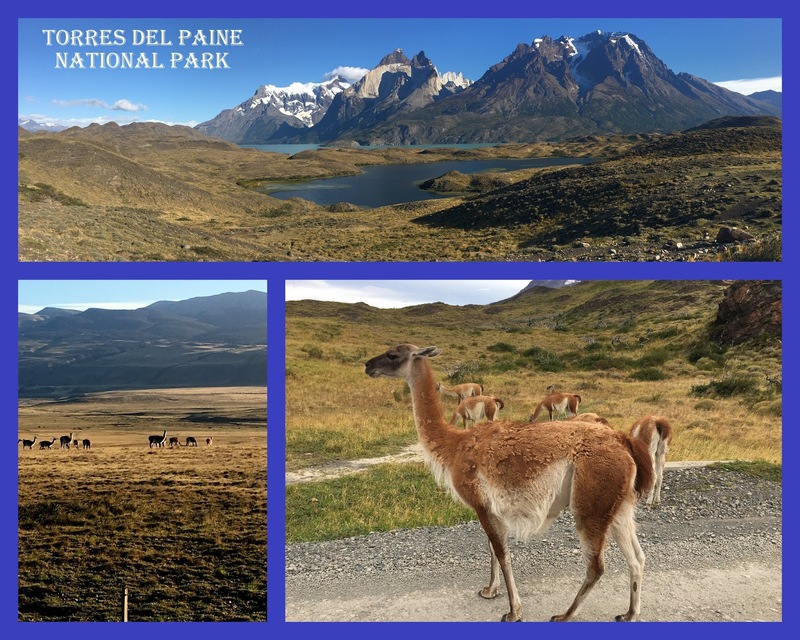 We drove back from Torres del Paine to Punta Arenas on Tuesday night (which was 4-5 hours), so we really didn't have much time in the park. That was my biggest complaint about our trip - too short. I calculated that out of the 9 days of our trip, I spent 72 hours traveling (either by plane or in the car). 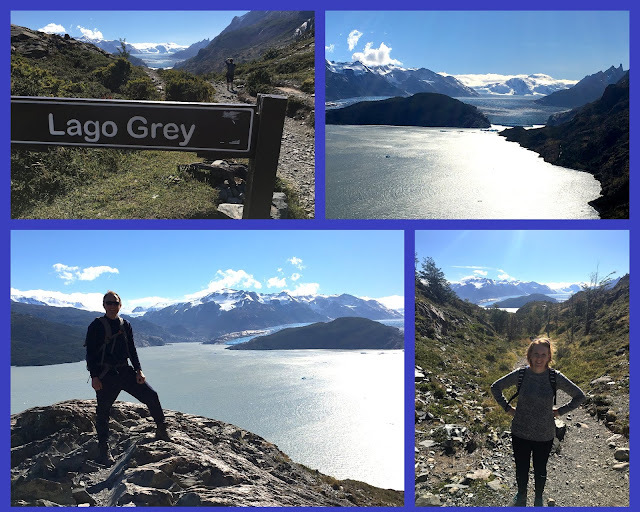 So we only had 6 days to explore Chile. 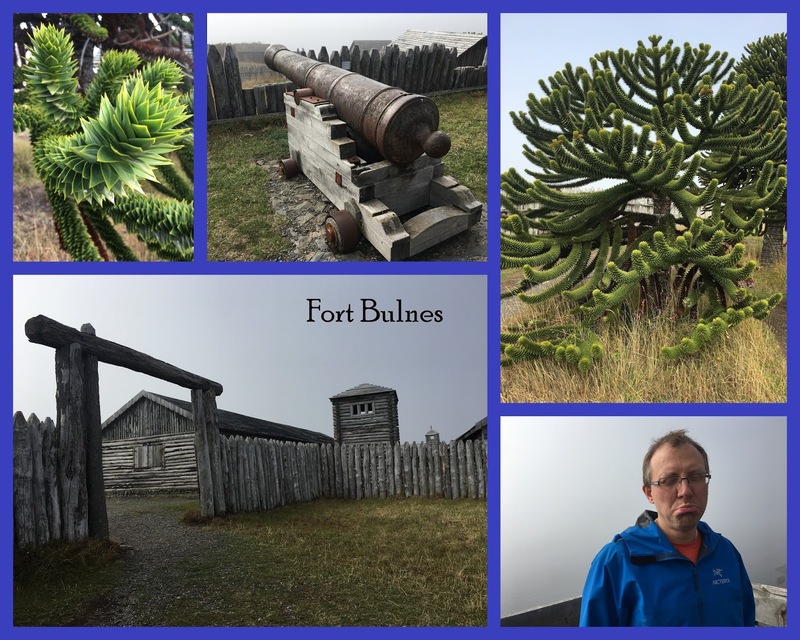 We shouldn't have spent as long in Punta Arenas either, because there really isn't much to see there. I did want to see where Alex comes in and out of when he goes to Antarctica and the boat he traveled on, but we didn't need 2.5 days there. We got to go to the Santiago Chile temple on Wednesday evening. 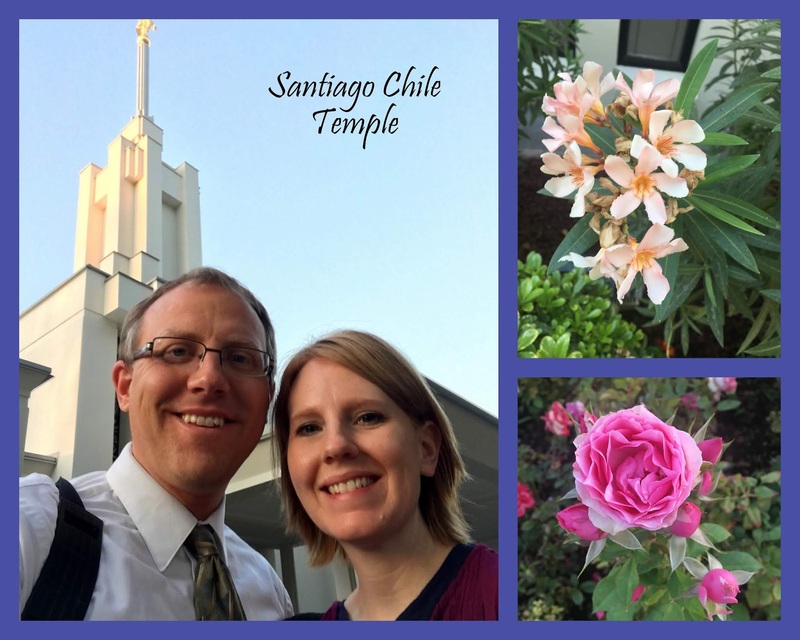 The great part about our hotel is that the temple was only a short walk from it (less than 10 minutes). We didn't have to take another taxi! 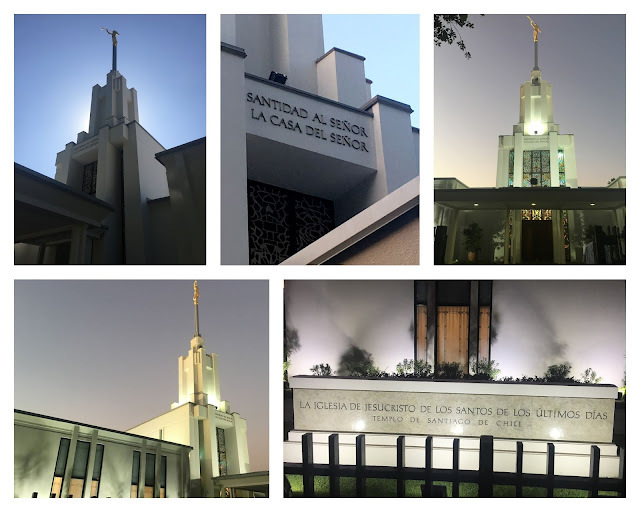 We enjoyed our visit to the temple, being able to participate in the work via headphones for translating from Spanish to English. 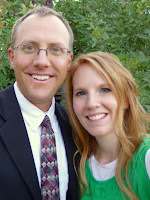 Afterwards, we got to talk to a couple from Idaho, who is serving an 18 month mission working in the temple - pretty cool. I didn't realize there were temple missions. We ended up being able to store our luggage at our hotel on Thursday. 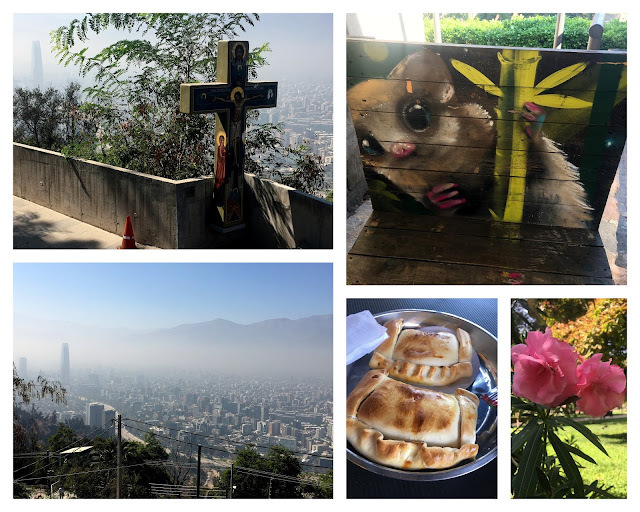 Our flight wasn't until 9:30pm, so we had all day to explore the city. We walked from our hotel to a nice viewpoint of the city. 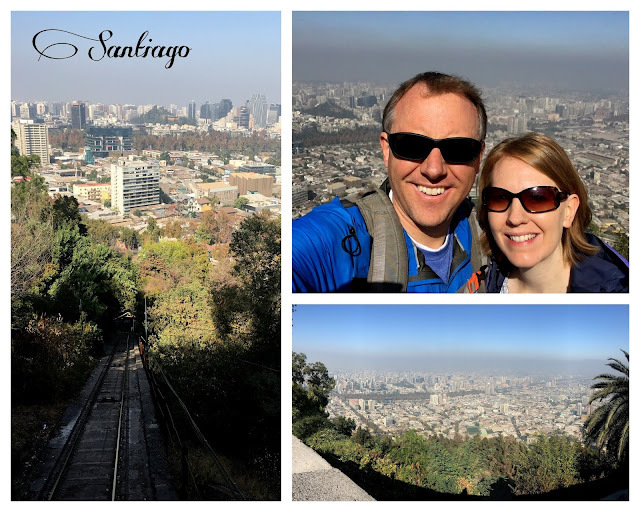 We rode a funicular up to the viewpoint. The view was nice... but so much smog! There is a famous statue of Mary up at the top of that viewpoint as well - the Sanctuary of San Cristobal Hill, a place of worship for the Catholic Church. We had some empanadas for lunch up at the viewpoint - I hadn't ever had one before - pretty good. In the smog, you can just see the tallest building in South America, Gran Torre Santiago. We went to see it, but then decided not to pay the $20-25 fee per person to go to the top (especially since we just saw what the view looked like from the other viewpoint - so much smog you couldn't see much at all). We also walked over to another famous part of the city, Plaza de Armas. There are some pretty cool buildings over there, but we didn't go in any of them. We took the metro from there back to the tall tower in the area they called "Sanhattan", and then walked back to get our luggage. 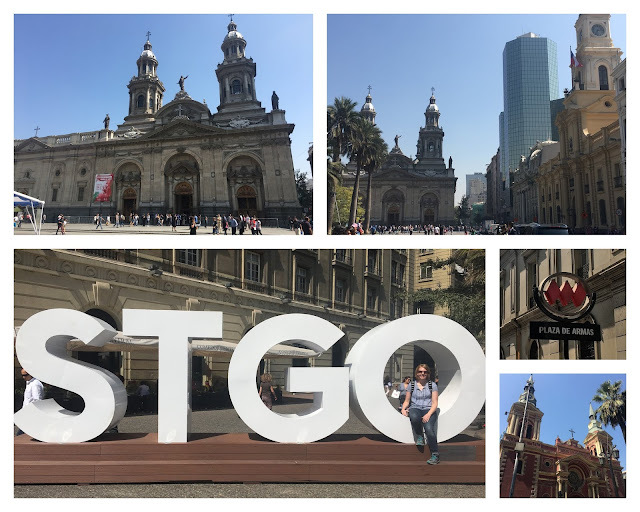 We ended up walking about 9 miles on Thursday through the streets of Santiago. We felt safe wandering around. The one thing I noticed about Chile is there are lots of stray dogs roaming around everywhere. We did take another taxi to get back to the airport on Thursday - this time the driver was a little more cautious. We also didn't take the freeway, so we got a tour through the city that wasn't a high speed ride. We had a good trip! 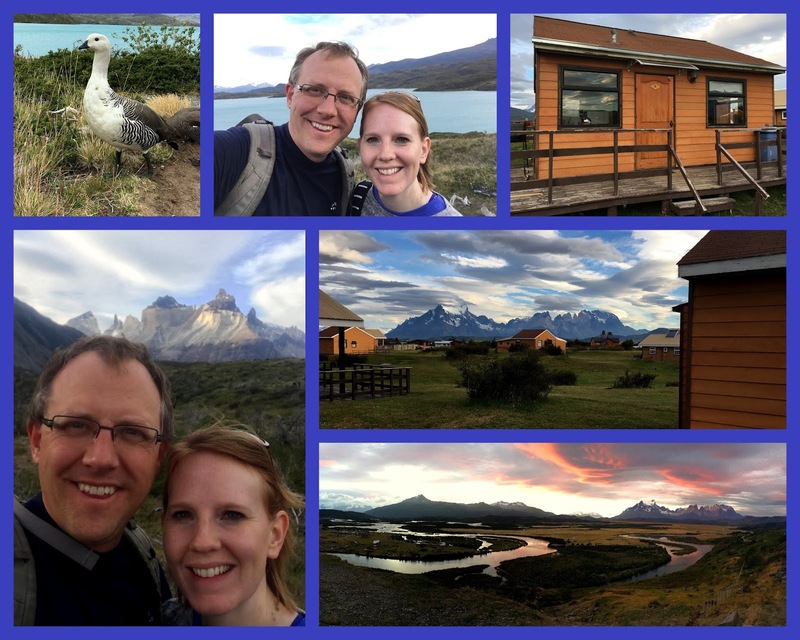 It was my first experience in South America, and I loved seeing Patagonia and visiting another temple. 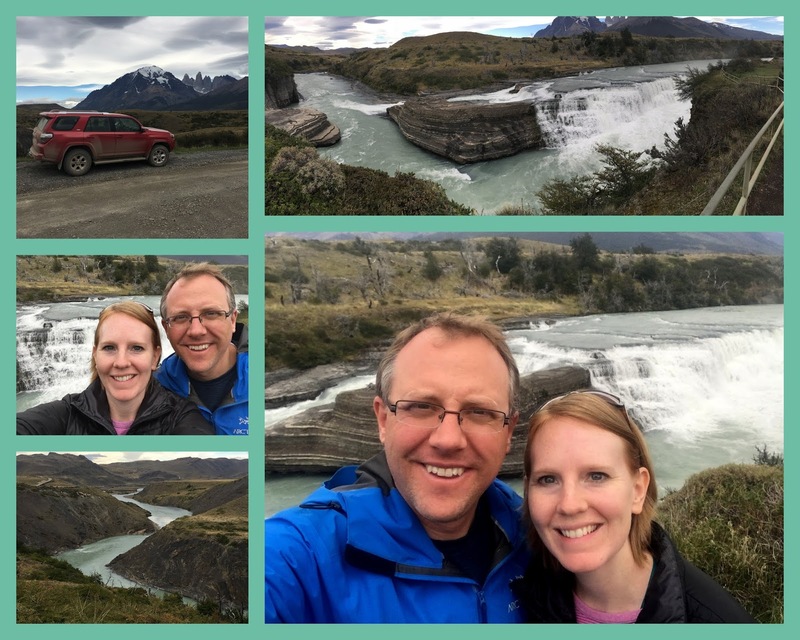 I was also happy to have a kid-free vacation - so much better to travel without kids! 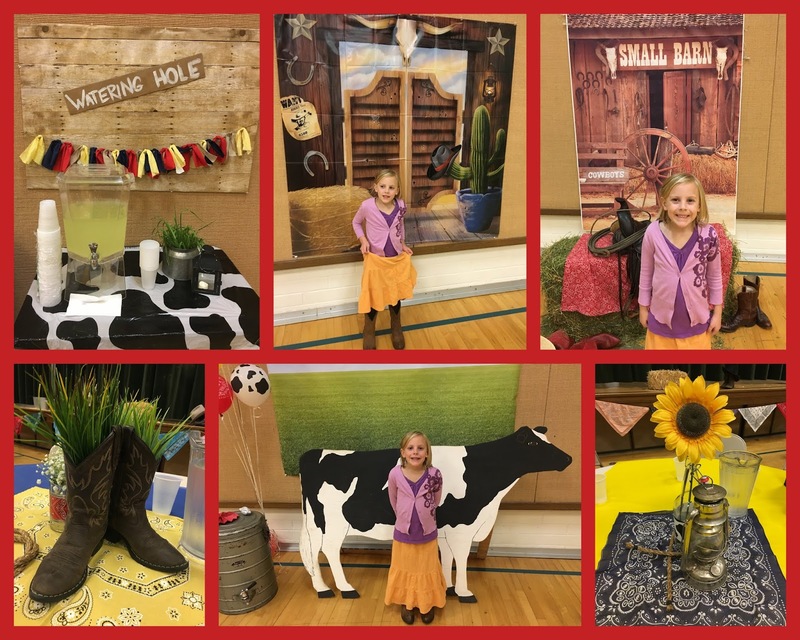 We had our annual event to celebrate the Relief Society. We did a service project and lunch. I can't think of a better way to honor Relief Society and its mission than by providing service to those in need. 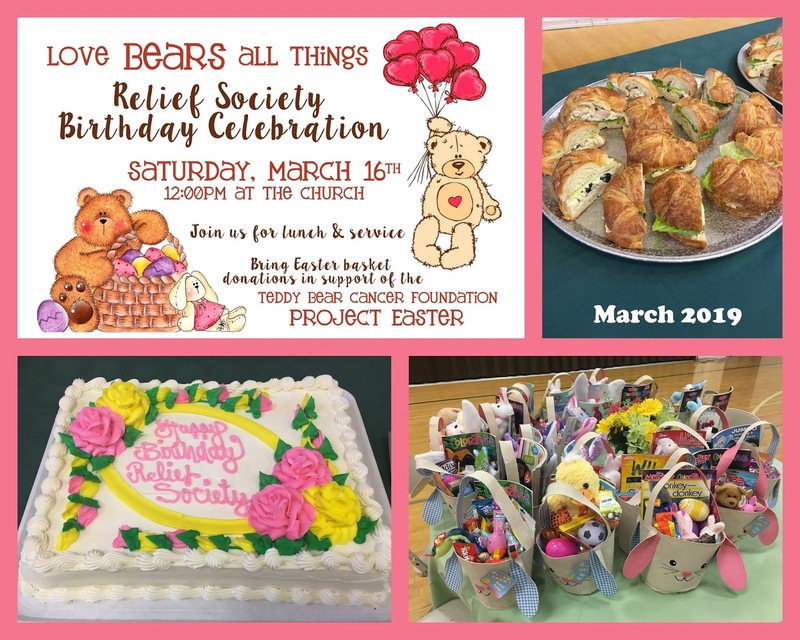 We brought donations to put together several Easter baskets for kids fighting cancer, supporting Project Easter Teddy Bear Cancer Foundation. We made Easter decorations, to go along with the baskets, and also wrote letters to missionaries serving from our ward. I'm on the Relief Society Activities Committee, so I helped plan the activity. I didn't have time to help much with putting it all together, but I did make the invitations for it. 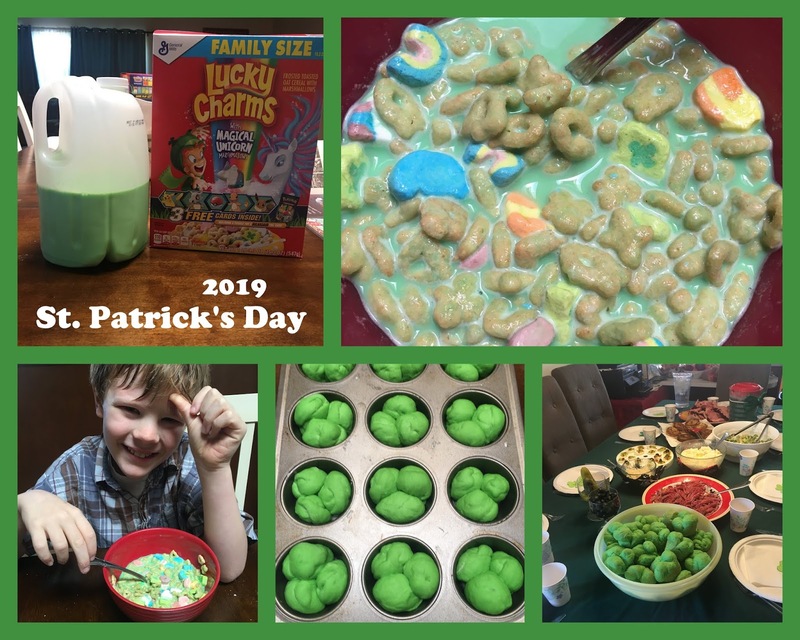 A few pictures from St. Patrick's Day... I contributed some green clover leaf rolls, salad, and key lime pie to a festive dinner with friends. 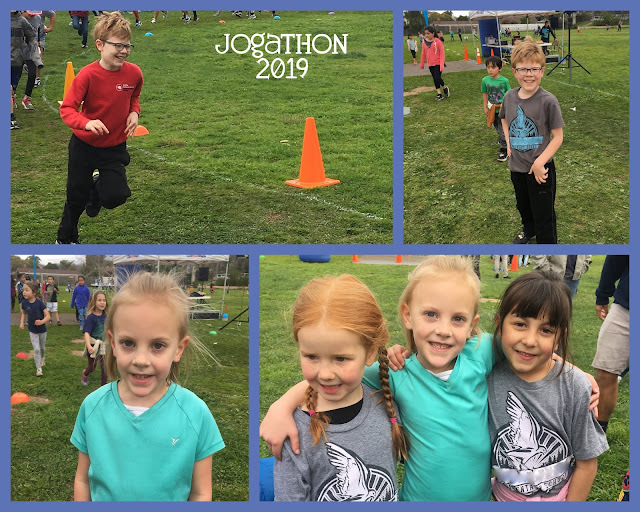 Fun weekend! 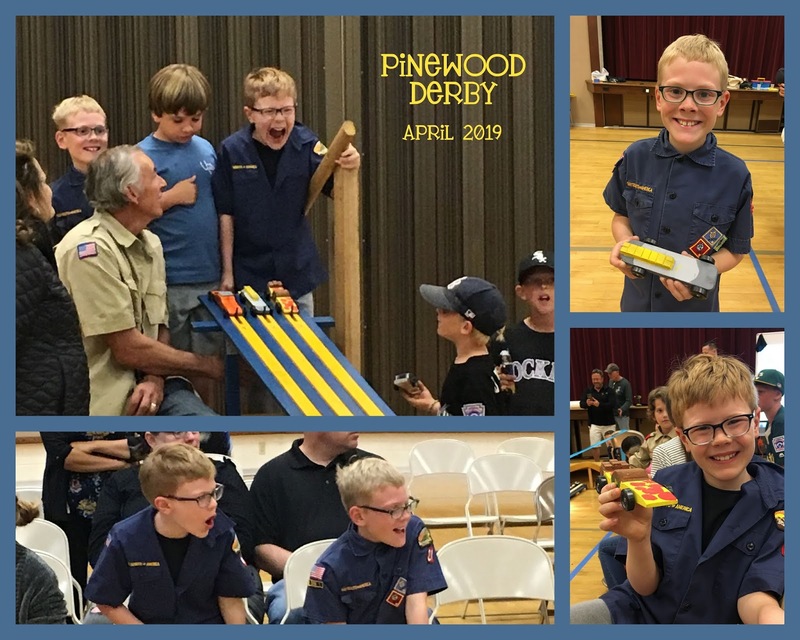 We just did pinewood derby, which was Weston's first one. He was really excited about racing his car. Owen thinks there were about 34 kids. Owen and Weston got 4th and 5th place, so their cars raced well! 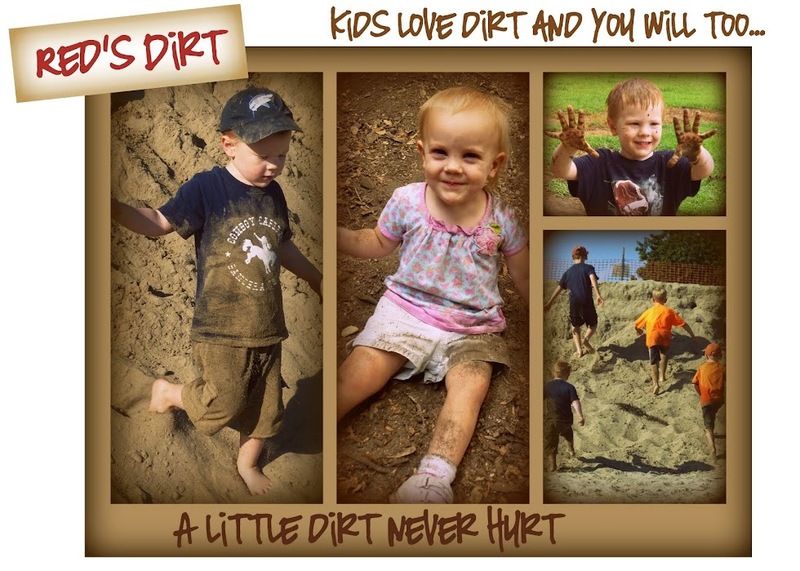 I came across this as I was de-cluttering - pretty cute. Jared had a big history project that he worked on for a couple of months. 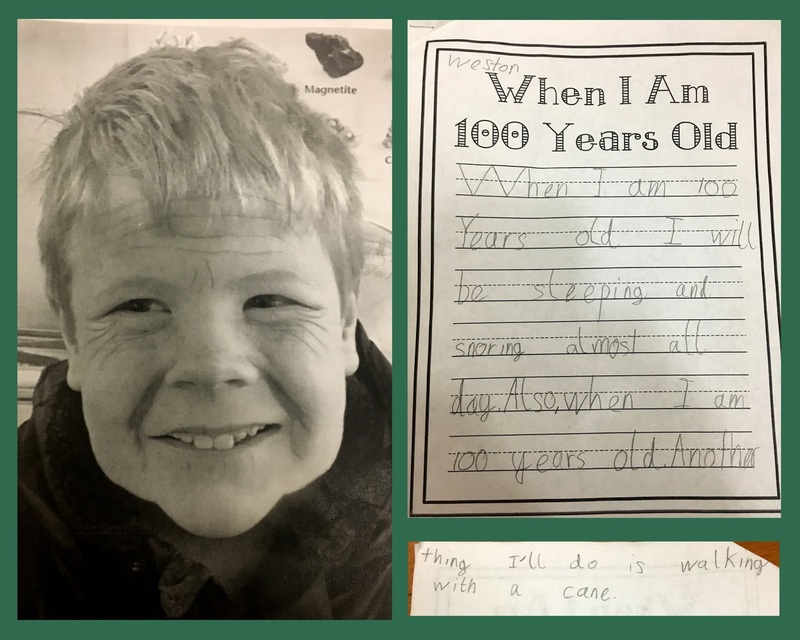 He had to research a topic, write a paper on it, create a mural, and do a group presentation in costume. He got the same general topic (Japan) as Nathan had in 7th grade, but he was a different person. Jared learned about Minamoto Yoritomo, founder of the shogunate in Japan. 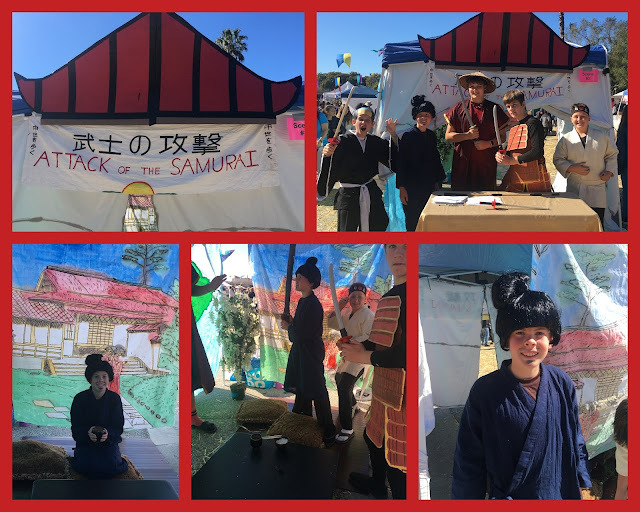 Their group chose to do their presentation on the Samurai. Within a 2 hour time frame, they did their presentation several times to 6th students, teachers, and parents. They did a great job! Here is a link to the special memory wire that explains how it works. Owen did a wax museum presentation on George Washington. I didn't know about it until 2 days beforehand, so we really scrounged around to come up with a costume (it probably looks pretty similar to Jared's Benjamin Franklin costume...) I wasn't here for the presentation itself, but I hear that he did a good job. 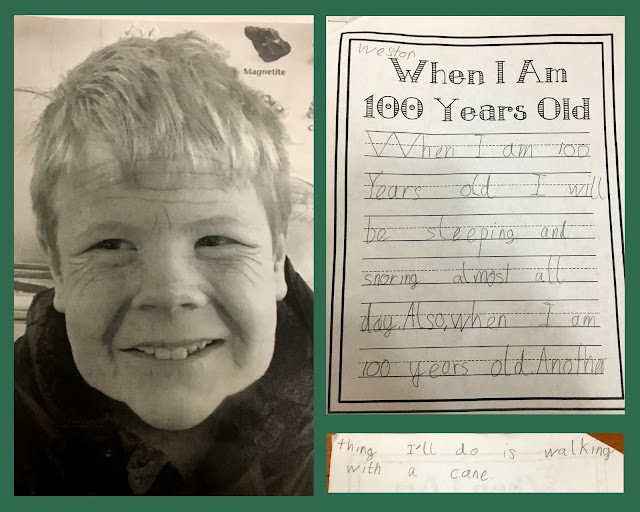 I got to go on another field trip with Weston's class to a local museum (we ate lunch outside, got to do a tour, see some artwork, and the kids got to do an art project). Jared made a cardboard boat for Savannah one evening. She was pretty happy about that. Seeing the boat made me think of one of my favorite stories from the Book of Mormon, about the Brother of Jared, who prayed to God in seeking for a way to light their boats as they crossed the ocean. While their boats were not sailboats (but were airtight barges), Jared's cardboard boat gave me an idea to supplement one of our New Testament lessons. In the Sermon on the Mount, it talks about seeking first the kingdom of God and a theme in Matthew 6-7 is prayer. 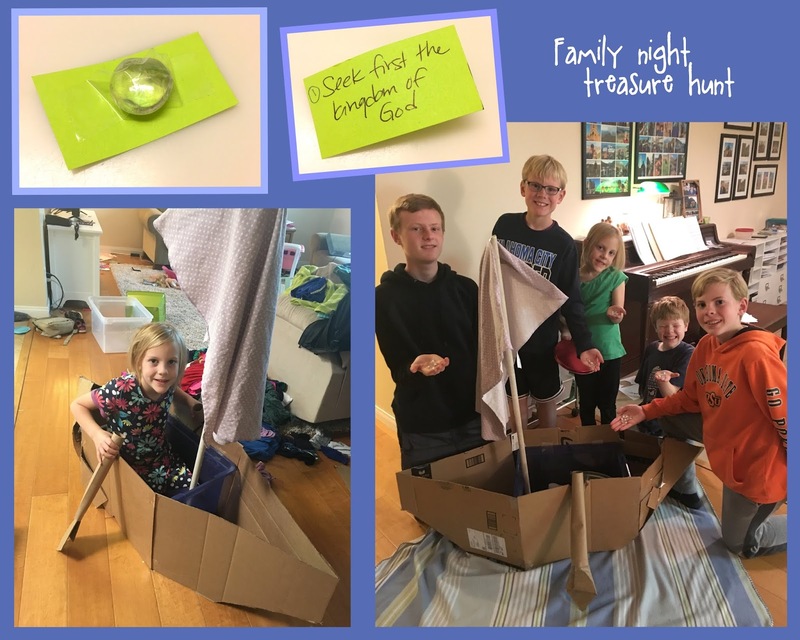 I used the idea of seeking and put together a treasure hunt in the house. Each of the clues also had a clear stone (to represent the 16 stones in the story of the Brother of Jared). The clues had scriptures on them, with a key word that led them to the next clue. Aside from the first one (seek first the kingdom of God), it was pretty evident where to look for the clue. 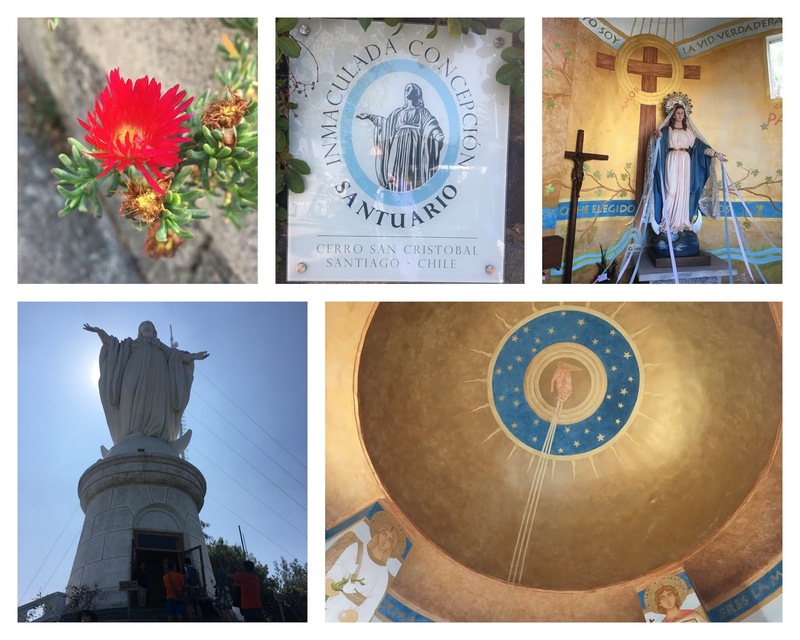 The first one relied on how well they listened in the first part of the lesson, when we talked about ways that we seek God (by reading scriptures). That first clue was on the shelf by our scriptures. Some of the other clues had things like the "bread of life" and "let your light shine" or "come unto me and I will give you rest". 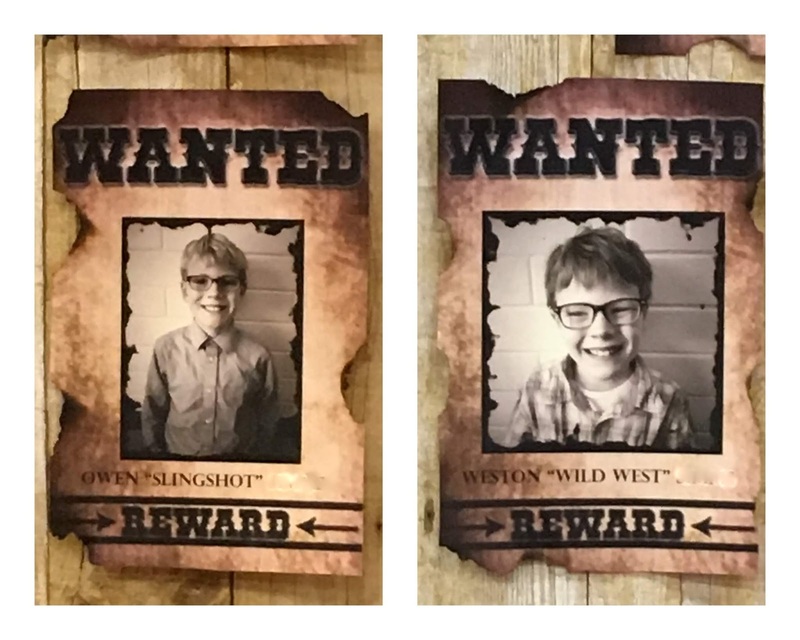 It was pretty fun for the kids to run around the house doing their treasure hunt. 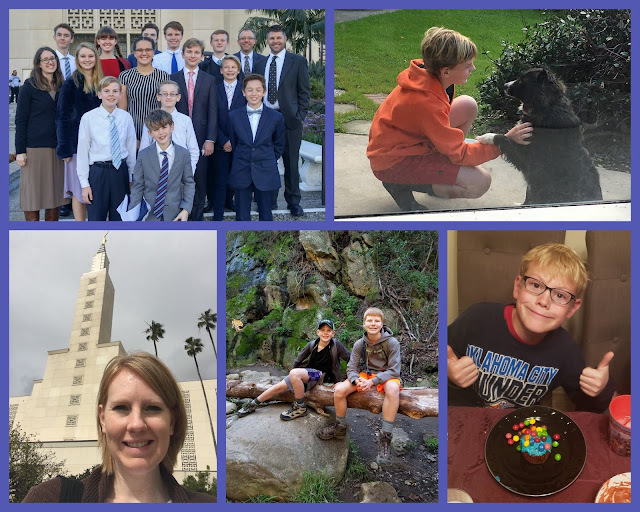 Once they collected all 16 stones, we talked about the story of the Brother of Jared and how faith and prayer allowed him to be successful in getting light for their boats and to reach their destination. We talked about how our own prayers and faith help us to reach our goals. I love the thought of the vessels being us, with the light of Christ inside, lighting our way. One side note that I find interesting about the story of the Brother of Jared is the role of the wind in getting them to their destination. While we usually think of wind as a hindrance, something that we struggle with, the winds were a good thing in this story. The winds, that God caused to blow, pushed them towards their destination, the promised land. They needed the winds to constantly push them along in their journey. And even amidst all of the storms, the winds were a blessing, and the light continued to shine for their whole journey. I love thinking about how sometimes we have to let God push us along and also that His light will never cease to shine (if we want that and allow it on our journey of life). 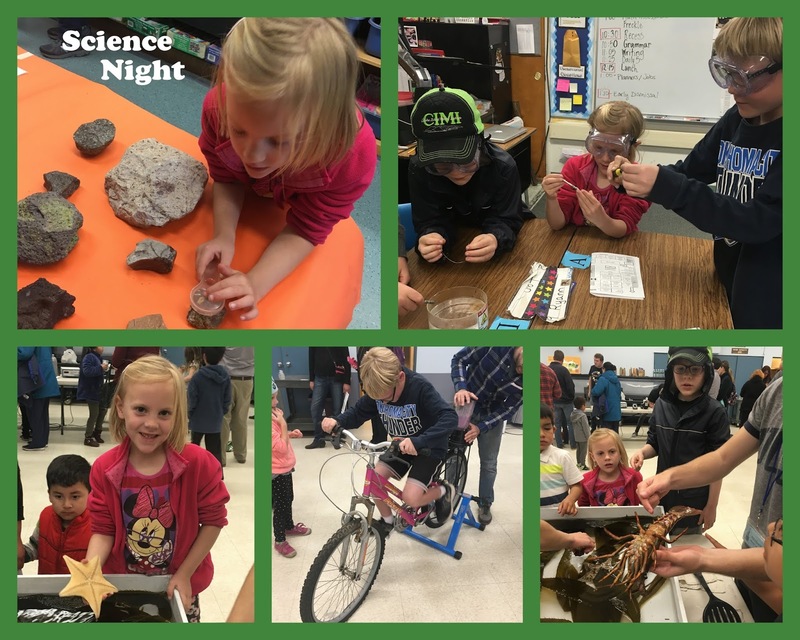 Here are some various things from February. Alex went with Nathan, Jared and some of the youth on an early morning temple trip. They had to be there a little before 7:00am, so it was a really early start. Nathan and Jared also had a multi-stake conference and dance in the afternoon and evening, so it was a long day. Nathan experienced his first slow dances and all the awkwardness of dancing with girls. I went to the temple by myself the next Friday, when the kids had off of school. Jared went on a hike with his friend Jay on the Monday off of school. Owen had a good time at a birthday party, putting a massive amount of sugar on his own decorated cupcake. 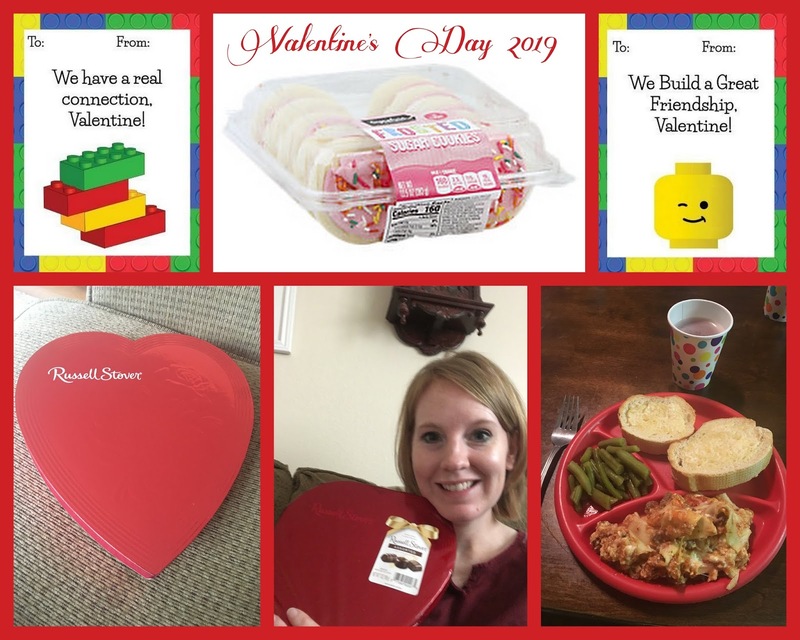 Alex was out of town for Valentine's Day (again), but he surprised me by buying some chocolates ahead of time and then sending me a message where they were "hiding." I may have consumed the whole box in 2 days. The kindergarteners celebrated 100 days of school by parading through all of the classrooms. They made shakers, filled with 100 items. Savannah chose to put pennies in her shaker. They had fun making noise throughout the school. 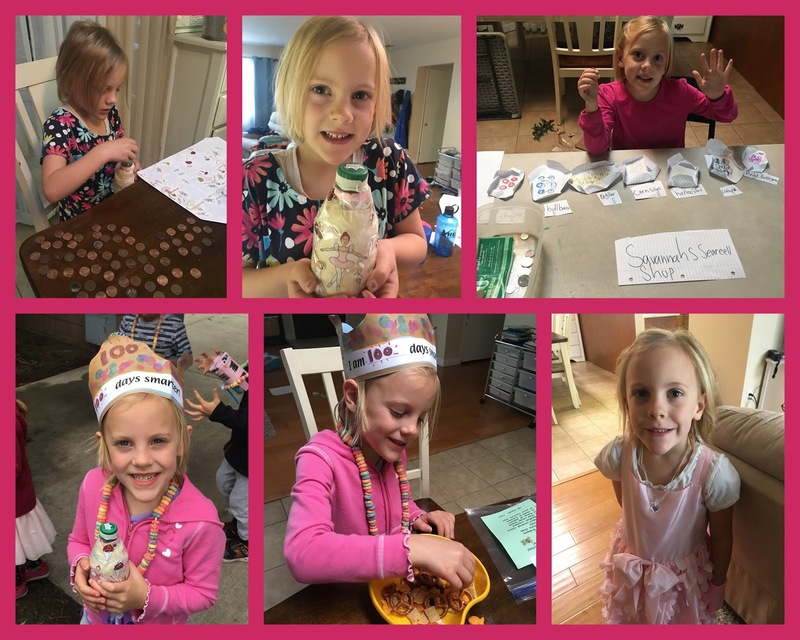 Savannah made her own cereal shop at home one day - she wanted us to pick a kind of "seareell" and pay money for it. She is very creative... and cute! Weston's hair looks pretty good on crazy hair day... his hair is crazy every day. 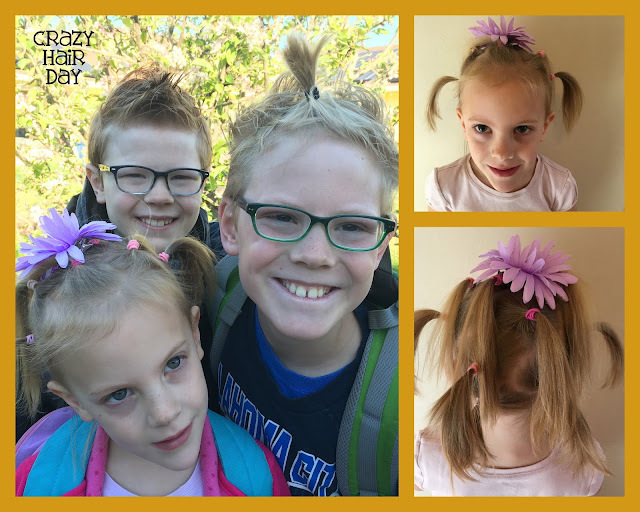 But it gets styled on the school's crazy hair day!